“For the record, I'm sick to death of all this Duck Dynasty / Freedom of Speech / Gay / Christian / A&E / Persecution / Bull S**t. There, I've said my two cent's worth. That feels better. Was it something that I said? (Yes, I am being facetious) Apparently it was. Maybe we need to back this train up a bit and look at the bigger picture. What happened to bring us to this place? 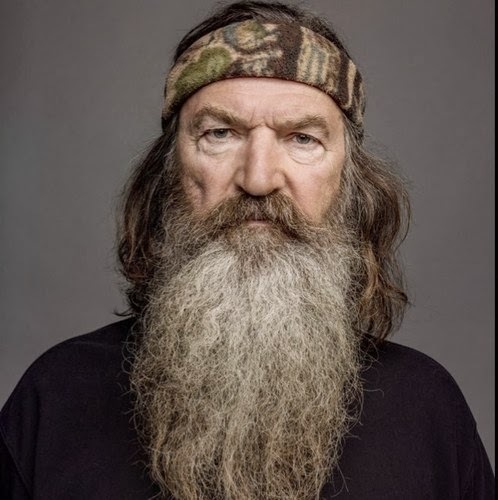 Duck Dynasty’s patriarch, Phil Robertson, was allegedly asked his opinion about homosexuality, or some such thing. As a Christian, it’s not surprising that his alleged anti-gay response ruffled some feathers. What is surprising is that there was an apparent surprise at all to his answer. What did they think he was going to say? For a while it seemed that at every turn, social media had an opinion or ten (or a hundred) as to what actually happened and as to what was allegedly actually said and by whom. A&E allegedly got involved and suspended Phil from the TV program. Tempers flared as both left and right wing jumped head-long into the milieu, making all sorts of accusations against each other, including charging A&E with violating Robertson’s constitutional-given right to freedom of speech and even persecuting him for his faith, while all the while his opponents balked at such notions. One side blamed the fiasco on Satan, whereas the other saw the hand of God in the controversy. For the record, while I too am a Christian, I am not a huge fan of most things Hollywood, and at the end of the day, if truth be told, the outcome doesn’t much matter to me one way or another. Yes, I’ve watched a few early episodes of Duck Dynasty, but like most TV shows, I can easily take it or leave it. As a matter of fact, if it were only up to me, our cable box could go on the fritz and not work at all, and it could conceivably be weeks before I even noticed that the TV wasn’t working. But that’s just me. I was going to remain quiet, but here goes nothing: So, everyone's in an uproar because their patriarch hero character on a pseudo-reality TV show that really isn't that good was rightfully asked by contract to stay home. This created drama for many who want to claim he and they are being persecuted. Something about freedom of speech. Yet, throughout the world we still have brothers and sisters who are being persecuted and massacred. Our first world problems pale in comparison to those of our brother Saeed Abedini, or of the Nigerian and Syrian Christians who's lives were taken. Do I apologize for saying what I did? No, I stand by it. However if it offended someone (which it obviously did), that is regrettable. Still, that is the nature of social media and the players therein; they’ve all got opinions, myself included. Sooner or later, someone is going to get their feelings hurt. I know, I've had my feelings hurt before too. But really? Over a TV show? So, with all do respect to my opponents, and at the risk of offending some folks even further, I will close with a classic tune from The Eagles. However, a caveat is in order: If you're easily offended by coarse language, you may NOT want to play this song. Is it time that we all maybe just "Get Over It" and move on with life. Is this really that big of a deal? What about people with real problems? As someone once said, "I complained about having no shoes, until I met a man who had no feet" (anonymous). Maybe, as my friend Gibby said, "Our first world problems pale in comparison" to some of the sufferings going on in the world around us. As other brothers and sisters in places like Syria are being massacred for their faith, maybe it really is time that we paused from all this TV nonsense and took a real reality check. Just a thought. Peace. Taking a 'Bite' out of Universalism?